Letterbissen kann bis Mitternacht Ost-Zeit (USA) gespielt werden. Welcome to this original word puzzle from Jeff Widderich and Andrew Stuart. Letterbissen finally allows crossword and scrabble fans to show off their skills. Compete against the rest of the world for the highest score and best arrangement of words. Letterbissen is not timed. You have all the time in the world to build a perfect crossword. The space on the board and the letter selection and sequence are your only limiting factors. Objective: Score the most points by using the letters from the tray to build a crossword puzzle. 1. All or a selection of the letters in the top row are to be used to build the first word. These are marked in GREEN. 2. After placing your letters any new words will be checked and validated. Bad words will highlight in red. Good words will highlight in green. You must also connect the words to previous words. If you have no bad words the "Submit" button will turn green. You must press "Submit" to unlock the next set of letters. (Think we are missing a valid word? You can submit new words here). 3. 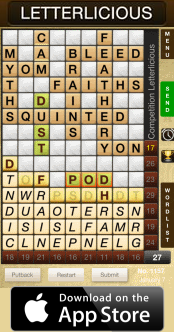 Any letter used to build your first word has exposed some or all letters directly below in the second row. These 'exposed' letters can now be used to build your second word. Each turn you have a maximum of nine letters at your disposal. 4. The space in the tray can be used to place more words. In effect the board is growing when letters are used in the tray. Scoring: complete a row or column and score the corresponding points. Additionally, four letter words score a bonus point, five letter words +2 points and so on. The longer your words the greater the bonus points. When you have finished all the letters or gone as far as you can, you can "Submit Your Game". You solution can be compared to everyone else's and if your score is high enough, your solution will be displayed in our top 10. Congratulations if you manage this achievement! This page was last modified on 23-Dec-2016, at 10:31.